High Capacity Organizer with 36 pockets sold here. 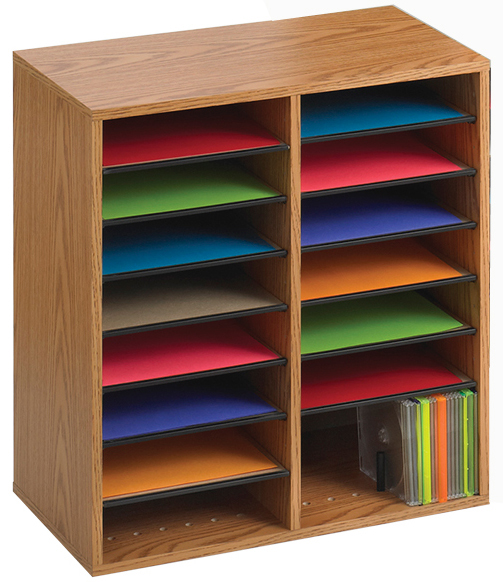 Literature Organizers feature sturdy hardboard shelves which are adjustable and removable to form custom compartment sizes (minimum size is 9"W x 11-3/4"D x 2-1/4"H); shelves have a 15 lb. capacity. Organizers have 5/8" thick compressed wood cabinetry with a durable oak laminate finish and a solid fiberboard back. Black plastic moldings serve as label holders (labels included). Ready to assemble. 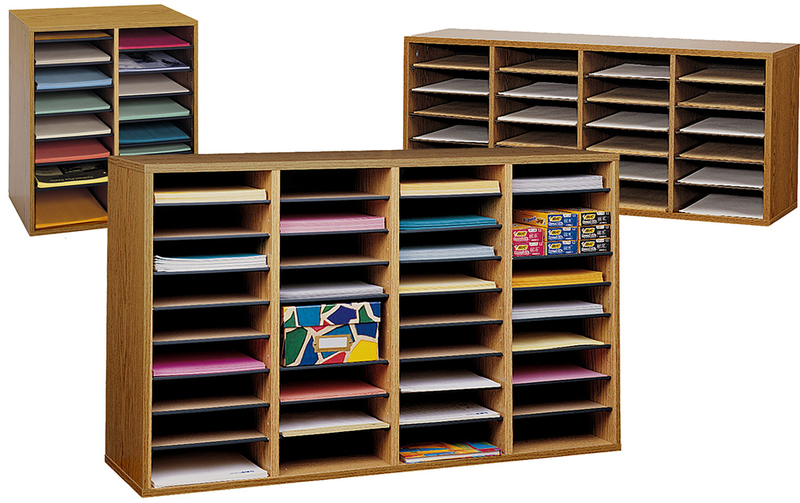 High Capacity Organizer includes adjustable shelves form up to 36 letter size compartments. Overall 39-3/8"W x 11-3/4"D x 24"H. Shpg. wt. 48 lbs. PRICE INCLUDES SHIPPING! Please allow one to two weeks for delivery. 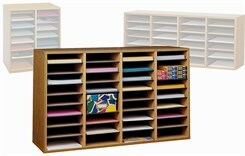 Medium Capacity Literature Organizer includes adjustable shelves form up to 24 letter size compartments. Shelves have a 15 lb weight capacity. 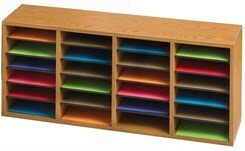 5/8" thick compressed wood cabinetry with a durable oak laminate finish and a solid fiberboard back. Black plastic moldings serve as label holders (labels included). Measures 39-3/8"W x 11-3/4"D x 16-3/8"H overall. Shpg. wt. 36 lbs. PRICE INCLUDES SHIPPING! 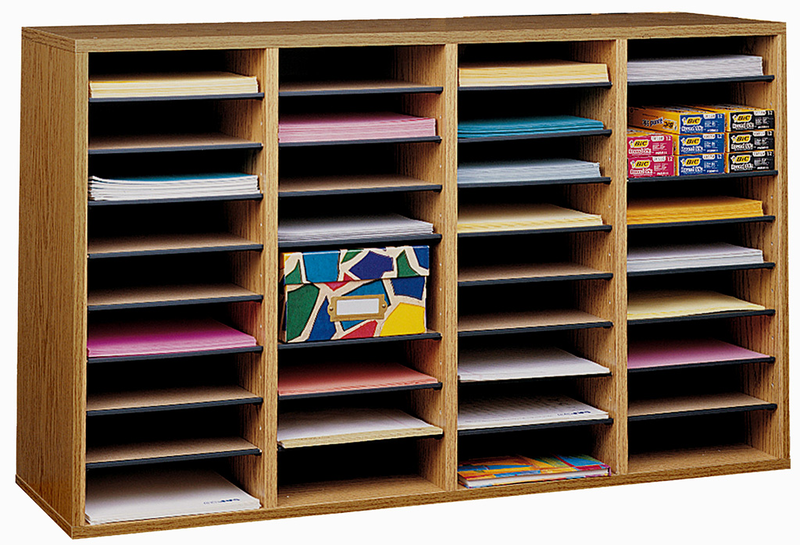 Vertical Literature Organizer includes adjustable shelves form up to 16 letter size compartments. Perfect for tight spaces. 5/8" thick compressed wood cabinetry with a durable oak laminate finish and a solid fiberboard back. Black plastic moldings serve as label holders (labels included). An adapter rail allows for CD storage on the bottom shelf. Overall 19-1/2"W x 11-3/4"D x 20"H. Shpg. wt. 20 lbs. PRICE INCLUDES SHIPPING!